Linda qualified as a veterinary nurse in 2002 from general practice. She then worked at 2 world-leading university referral hospitals, obtaining the Diploma in Advanced Veterinary Nursing (Medical) in 2005; & in 2009, became a Veterinary Technician Specialist in Oncology, and a member of the Academy of Internal Medicine for Veterinary Technicians. As well as her specialist interest in oncology, Linda also has interests in analgesia, clinical nutrition, medical nursing, behavioral health & welfare, maintenance of optimum quality of life in chronically ill patients & clinical teaching. Linda’s interest in training & behavior evolved over her nursing career as she became more aware of its importance to patient’s needs in their veterinary care. In 2012, Linda became a graduate of the Karen Pryor Academy for Animal Training & Behaviour, & she is now proud to be a faculty member at the Academy. Linda has since gone on to further advance her training & education in animal training & behavior, & continue to study – having credentialed for the examination for the Veterinary Technician Specialist in Behavior in October; & she is about to embark on a top-up year for a degree in Animal Behaviour & Welfare this Autumn. 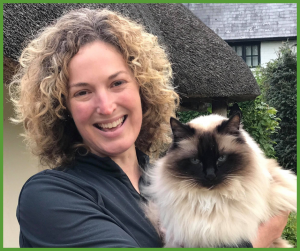 Linda owns & run Inspiring Pet Teaching, which is aimed at pet & owner training & education, as well as CPD provision – she frequently writes & present for the veterinary press & at CPD events for vets, vet nurses, training professionals & owners. Linda regularly collaborates to provide course content &/or teaching & reviewing for Karen Pryor Academy; International Cat Care, Fear Free; ONCOREepd; as well as many other continuing education providers, both locally, nationally, internationally, & online. The vet-trainer connections & patient-friendly veterinary practice is a passion which allows Linda to meld her veterinary nursing & behavior knowledge for the benefit of patients, staff & owners.